Staying at one of Walt Disney World's resorts is great - but it comes at a price. The best value is to stay off property, either at a value hotel or at a vacation home like our Encore Resort at Reunion villa. If you are staying at our home during a non-peak season, you can book for as under $25.00 per person per night! This is an exceptional saving and you have your own hot tub, pool and unlimited access to an amazing water park. If you want to save money and increase your enjoyment at the parks, avoid the busiest times of the year. Don't even consider Christmas or Easter - the parks are packed and, due to increased demand, prices are higher. Generally, if the kids are out of school, the prices will be higher and the lines will be longer. The best times to go are January through to mid-February, in the fall and early December. If your distant isn't too far, consider making it a road trip and drive to Florida. This alone can save your family thousands of dollars in airline tickets and rental car expenses. We travel from Ontario to Florida and it generally costs under $300.00 in fuel. Having the car is also super convenient when it comes to going to the grocery stores or coming and going to the parks at our convenience rather than the convenience of the park shuttles. Check ahead to see if there are any discounted theme park tickets. Universal Orlando will often have a "Buy 2 days, get the 3rd free" promotions. Walt Disney World generally has a deal for Florida residents, Canadians or guest from the United Kingdom. You may also check out CAA, AAA, retirement associations or see if there is a military discount. The park hopper at Walt Disney World seems like a great idea. With this optional ticket you can "hop" between Magic Kingdom, Epcot, Animal Kingdom and/or Hollywood Studios as often as you would like during your ticket period. The park hopper option for a four day ticket will cost you an additional $84 per person. For a family of 5, that $420.00! The reality is, most people are very happy to visit one park per day during a stay in Orlando. Trying to pack in 2 or more parks per day is likely too ambitious for you average Disney exploring family. Save the money and avoid the park hopper. ​It a little know fact that you are allowed to bring your own food and drinks into Walt Disney World and Universal Orlando. If you are staying at our Encore Resort at Reunion vacation home, wake up and enjoy a coffee and bagel in the morning before heading to the park. Grab the sandwiches and snacks that you packed the night before and head out knowing that you will save hundreds of dollars on your vacation. Also, bring along a refillable bottle and keep hydrated through the day by filling it up at the water fountains. Forgot your bottle? Go to any quick serve restaurant and ask for a glass of water with ice - no charge! One of the fun activities at Walt Disney World is to go to a character dinner that has a number of Disney characters visit the diners during their meals. It's a great time, but generally comes at a cost of about $60 per person for the meal! Want to meet Chip and Dale for free? Head over to Chip 'n Dale's Fireside Singalong at Disney's Fort Wilderness Resort. Every night they have a campfire and a movie and, best of all, it's free! 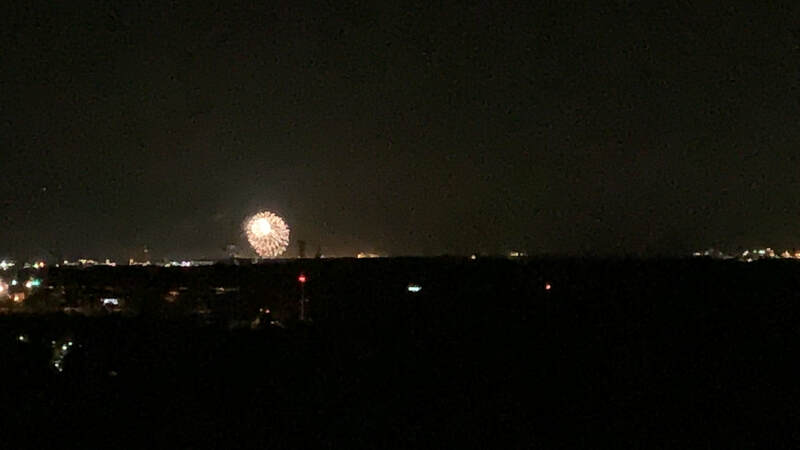 I think, without a doubt, the best place to watch Magic Kingdom's fireworks is right in front of Cinderella's Castle behind the statue of Walt Disney and Mickey (the backside of Walter). ​The only problem with that location is that you get to enjoy the show with tens of thousands of people all crammed into a tiny little spot. 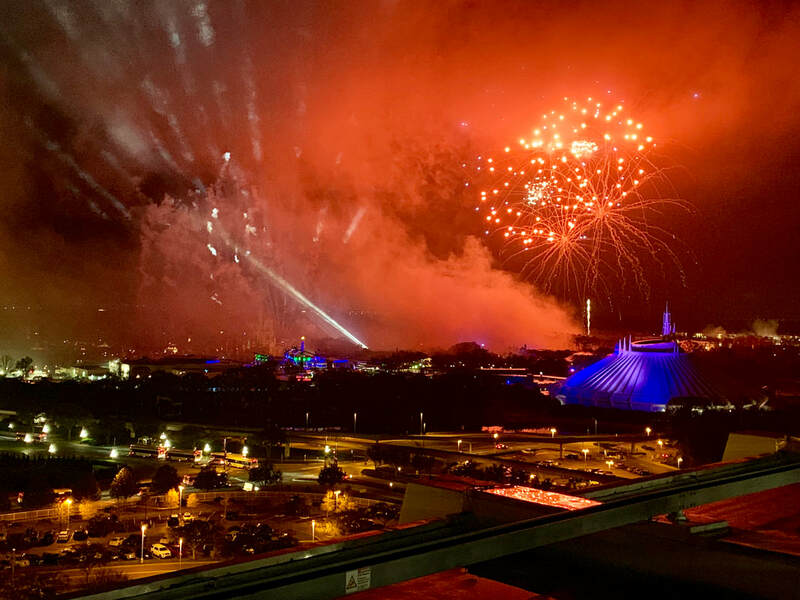 If you are looking for a more relaxed way to enjoy the fireworks, I suggest checking out some of the Disney World area's rooftop patios. They have fantastic views of the fireworks while offering amazing meal and cocktail selections. 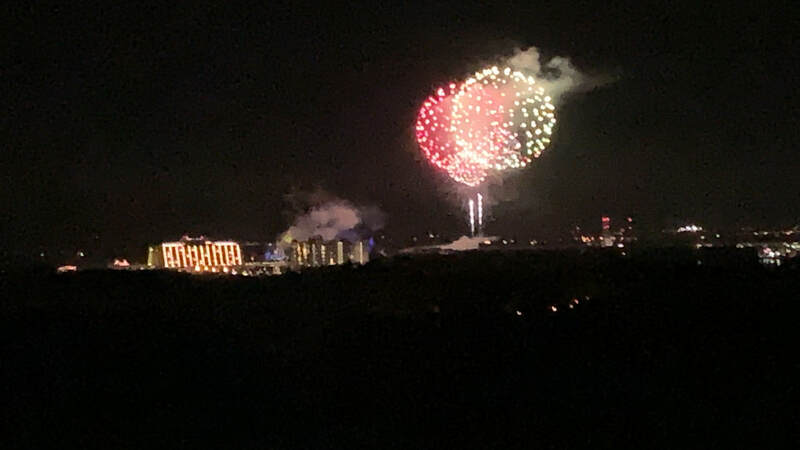 On my last visit to our Encore Resort at Reunion vacation villa, just a 5 miles south of Walt Disney World, I checked out the 3 best terrace patios where you can watch Magic Kingdom's Happily Ever After fireworks. Each offer advantages and disadvantages. The Contemporary Resort is located at the Magic Kingdom. It's so close to the action that the monorail goes right through the hotel! Atop the hotel sits the California Grill restaurant. This signature restaurant would be an amazing date night restaurant regardless of where it was located, but the cherry on top of this sundae is that it has the best view of the Magic Kingdom fireworks anywhere outside of Magic Kingdom. If you are spending the day at Magic Kingdom and you are planning a nice meal, this is the way to go. If you are hoping to just watch the fireworks and not have a meal, this is not the place for you. The restaurant has a private elevator and the only way to get on is with a reservation. You can't just head up and watch the fireworks. You can watch the fireworks from inside through the floor to ceiling windows or go outside on the terrace. You can eat your meal earlier in the evening and return with your receipt to access the terrace for the fireworks. If you aren't attending Magic Kingdom for the day, you get free parking with your reservations. You can only access the terrace if you have dinner reservations. It tends to be crowded and loud given that there are a lot of large groups celebrating birthdays and anniversaries. 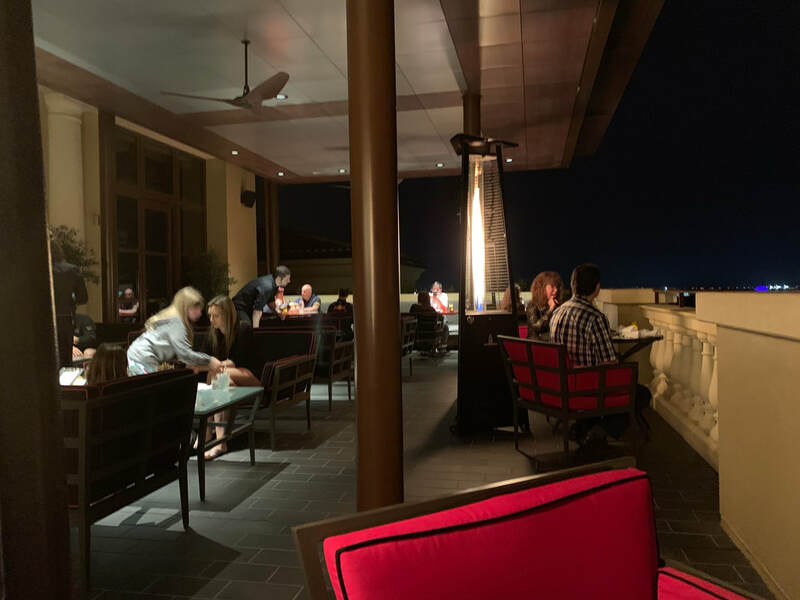 Since they allow earlier diners to return for the fireworks, the terrace can also get crowded - this is especially true for Sundays because they also offer brunch in addition to dinner. There is a beautiful Four Seasons hotel located within the exclusive Golden Oaks community located within the Walt Disney World Resort. It is located adjacent to Fort Wilderness Campgrounds. On the top floor is a fantastic terrace restaurant called Capa. With two outdoor terraces and an elegant dining room, their 17th-floor signature steakhouse serves fresh Florida seafood, Spanish-influenced tapas and expertly grilled cuts from our wood-burning grill in a romantic setting named among the Best 100 Wine Restaurants in the US by Wine Enthusiast magazine. 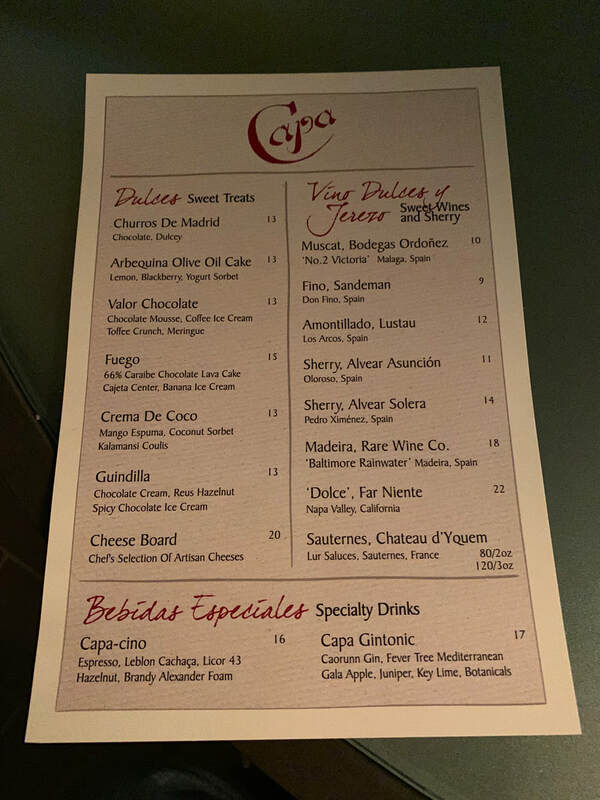 While I highly recommend making a dinner reservation and enjoying the fireworks after your meal, you can simply head to Capa 30 minutes prior to the fireworks and order cocktails and tapas and enjoy the evening. The atmosphere is great and the view of the fireworks, while not as good as the California Grill, is still fantastic. Located just 10 minutes south of Walt Disney World property is Reunion Resort. Our home at the Encore Club is located within this fantastic 3 golf course community. At the heart of Reunion Resort is the Reunion Grande, a condo style hotel housing 3 restaurants. The crown of the hotel is Eleven, an upscale steakhouse on the 11th floor. The patio outside the restaurant has a grand swimming pool (closed during dining hours) and a wonderful terrace facing Walt Disney World. On Fridays and Saturdays, enjoy live music with a cocktail, craft beer or glass of wine. No reservation is needed for the terrace and they offer free self parking. 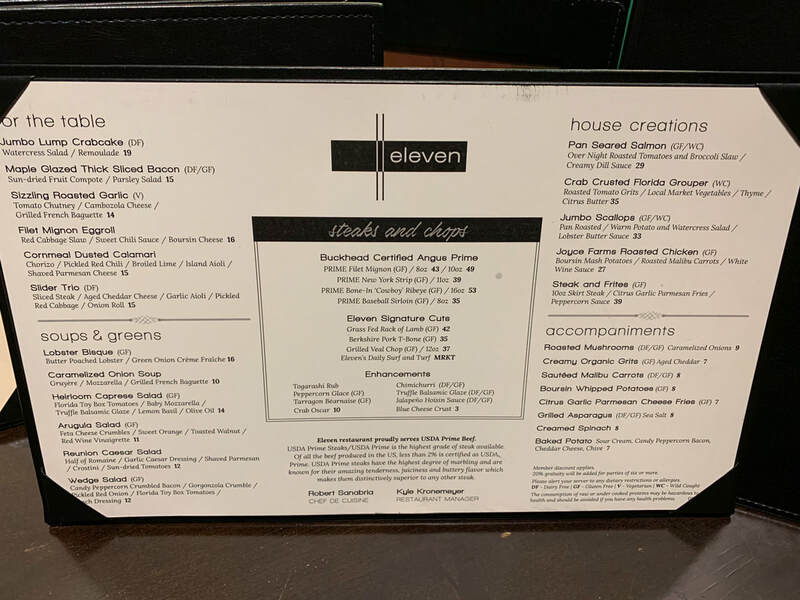 I have eaten at Eleven on a number of occasions and the meal has always been great. 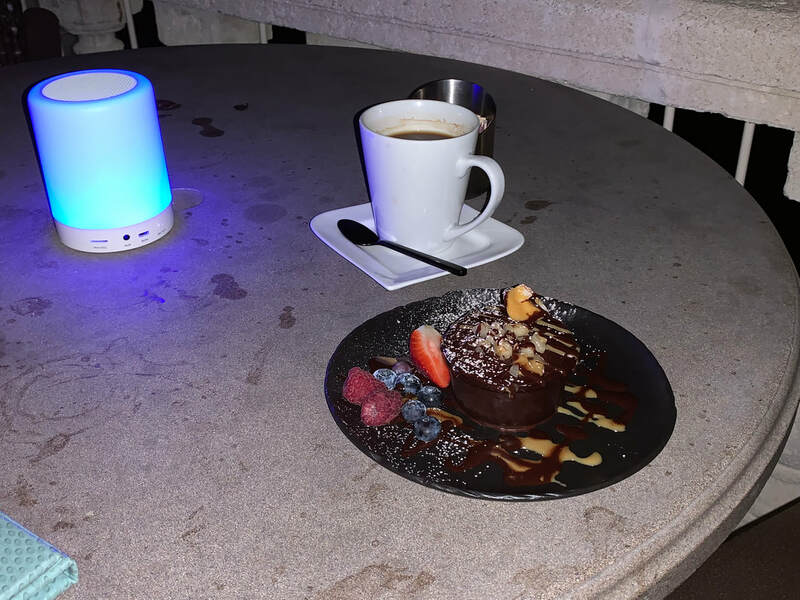 On the evening I attended to watch the fireworks this time, I simply had a coffee and a delicious dessert on the terrace. 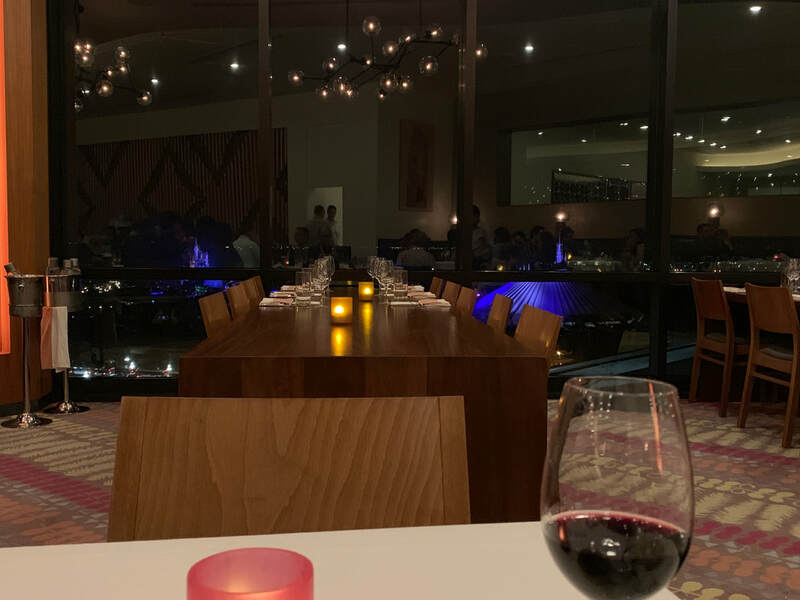 While the view of the fireworks is less dramatic than the California Grill or Capa, your reward will be the beautiful and quiet terrace ambience. Much quieter and less busy. In the off season you may even be the only people there. During the busy times, maybe 20 to 30 people. The fireworks, while nice, are not as dramatic as the other two terraces. Disney Springs is Walt Disney World's outside mall. Unlike normal malls back home, this mall has Disney magic sprinkled throughout. Not only are the stores well designed, diverse and fun to walk through, but throughout the day (especially after 4:00) there are many entertainers. Enjoy an evening watching singers, magicians, irish bands, dancers and string quartets. Many of these entertainers are located at the numerous excellent restaurant and patios located around Disney Springs, but some are on Disney designated stages. I would highly recommend spending an evening at Disney Springs and enjoy dinner or a drink at a pub. All of the Walt Disney World resort hotels are open to the public to shop and dine and I would recommend touring all of them as the architecture is fantastic. With regard to enjoying a day off from the theme parks in Orlando, I would suggest a visit the Jambo House at Animal Kingdom Lodge. At the gatehouse, let the guard know that you are going to shop at the resort stores or have a drink or meal at the restaurants. They will check your ID and let you through. Self parking is across the road from the hotel lobby and I challenge you not to be impressed once you enter the building. The shopping and restaurants at Animal Kingdom are incredible, but If you walk through the lobby and exit the building at the back, you will be rewarded with a park like savannah setting where you can walk around the African safari. Expect to see animals close up animals including giraffes, flamingos, zebras, gazelles, impalas, cranes, pelicans, waterbucks and wildebeest. Also enjoy s'mores by the campfire, available between 4:00pm and 6:00pm. Another great viewing area is behind the pool area of Jambo House. In 1996, Walt Disney World began building a planned community called Celebration. It was designed to be the magical American town with Disney flare. Walking around the main street town square, you feel like you have entered the set of The Trueman Show. There are coffee shops, quant art shops, an ice cream shoppe and outdoor cafes. There's even a dog bakery. The streets are lite with old world lanterns and residents travel around in electric beefed up golf carts. Highlighting the downtown is a 1/2 mile walking trail that circles the lake at the foot of main street. I recommend taking a walking tour of the town and enjoying a meal at Columbia, our favourite restaurant in Celebration. If you aren't up for Cuban food, try any of the other restaurants around town or just stop into Celebration Town Tavern and have a drink and a chat with the locals and tourists. If you are a guest at our Encore Resort at Reunion vacation home near Walt Disney World, you have unlimited access to The Encore Club water park. Spend the day at the 3 acre water park and relax by the resort style pool. The kids will love the Surfing Safari water structure with it's slides and water dumping bucket, while the teens and brave youngster enjoy the larger water race mats, tube ride or 50 foot trap door Aqua Drop. When your ready for a break, enjoy poolside bar and food service at very affordable prices. Many people are travelling to our Encore Resort at Reunion water park vacation home community in Orlando Kissimmee, they are primarily planning to go to Walt Disney World as the highlight of their vacation. For those travelling with toddlers and young preschool aged children (kids under 5), I have compiled my list of attractions that I think you should consider. These attractions are not only great for the younger kids, but also great for grandparents, as many of them are slow rides or shows. While this is not by any means an exhaustive list, here is my list of attractions suitable for those younger kids. Double check on the height restrictions for some of the rides, but I believe those listed here are for kids 40 inches or shorter. All of these attractions are great, but those with a * next to them are attractions I would certainly try to fit into your schedule if you can. Those marked with + are the ones that we almost always do when we are at Disney - the are always magical for us!! Enjoy! 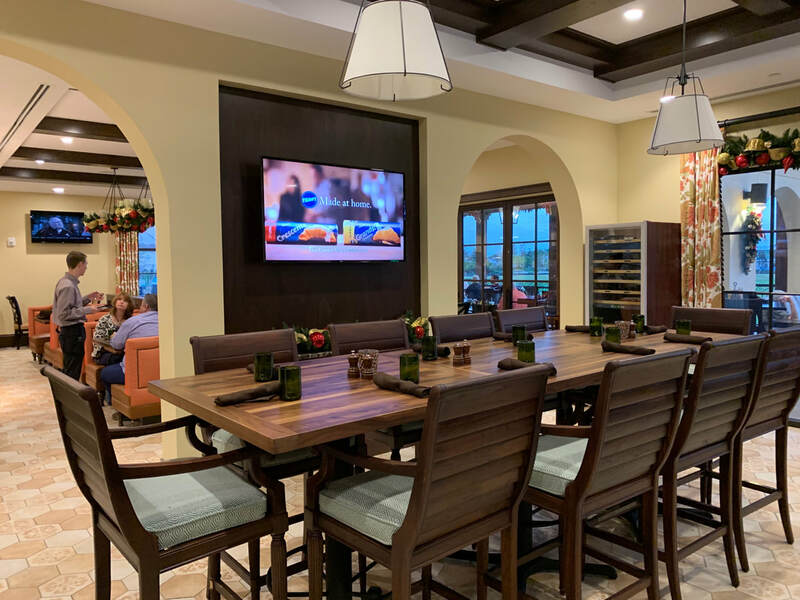 The new Nicklaus course clubhouse opened in December 2018 and houses Reunion Resort in Orlando Florida's newest restaurant - Traditions at the Nicklaus Clubhouse. The new restaurant offers American regional cuisine served in an upscale sports bar setting. The menu is seasonal and local with farm to table elements and a public house feel including craft cocktails and signature barrel aged bourbon program. The open-air kitchen (with chef's table option)and service style is designed to be friendly and welcoming and appeal to members and locals alike. They are promising weekend entertainment and signature drink menu make it a gathering place for celebrations large or small. 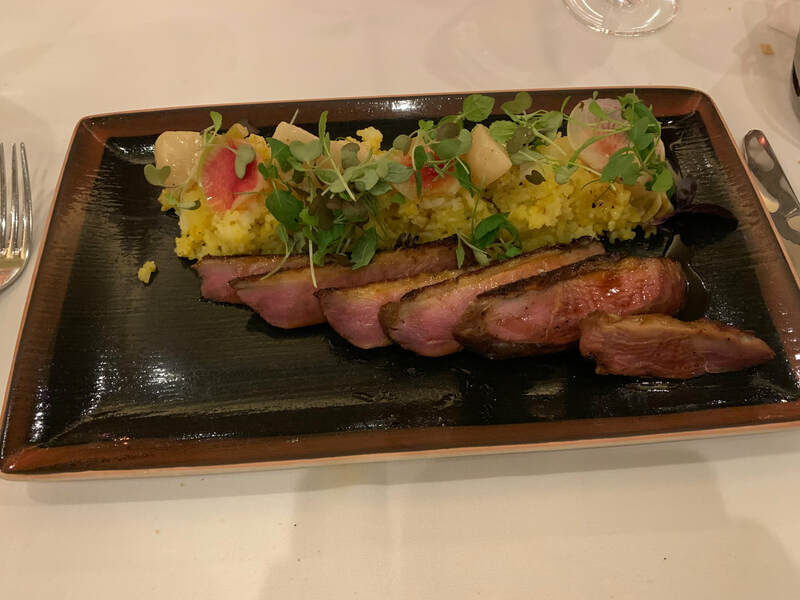 I will be travelling to our Encore Resort at Reunion vacation home in Kissimmee in early February and plan to check out this new dining option. 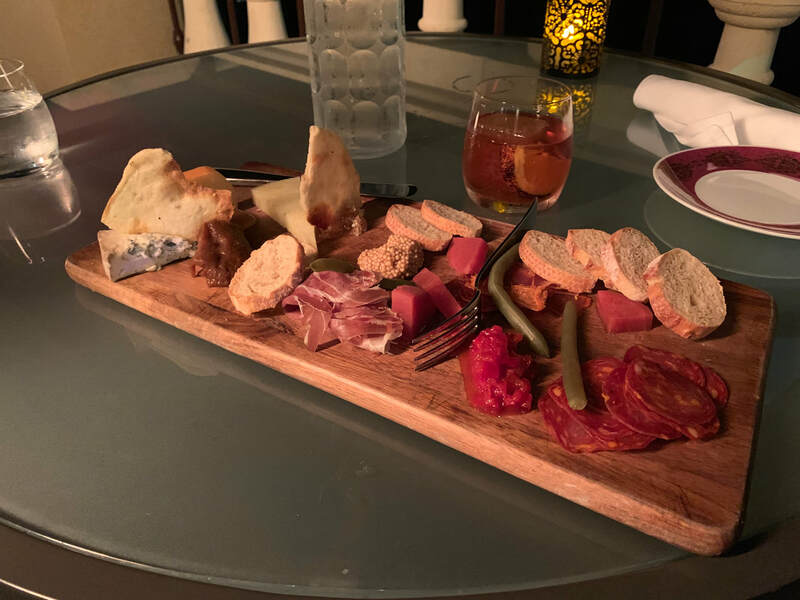 It is a short drive or a 20 minute walk from our Encore Disney World vacation villa, so it is a great new option for an evening out. Check out the other Reunion Resort dining options, available to our Encore Club vacation guests, on our website. I'm sure you will find that this will restaurant will quickly become one of the best restaurants near Reunion Resort. 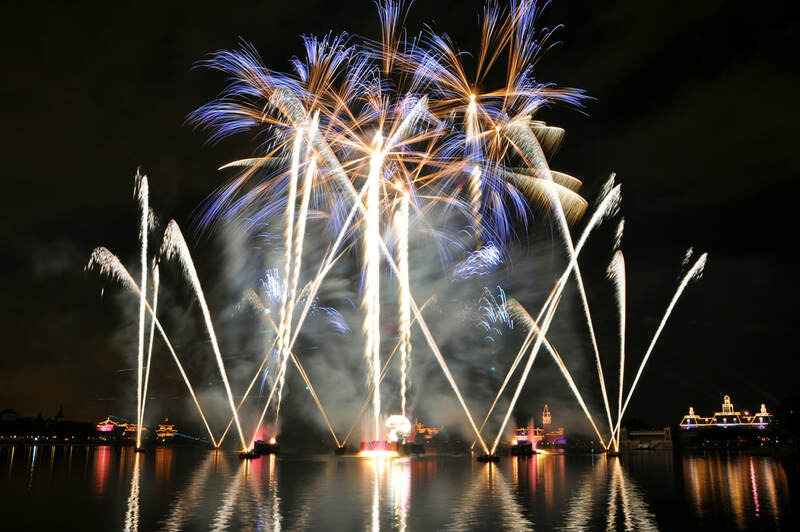 Just announced on ​Disney Parks Blog, starting January 18, 2019, you can now reserve a seat at, arguably, the best viewing spot to watch Epcot's fireworks "IllumiNations: Reflections of Earth" - the patio behind the United Kingdom Pavilion's Rose and Crown restaurant. Better yet, your reserved seat comes with a 3 course meal which includes unlimited alcoholic and non alcoholic beverages. 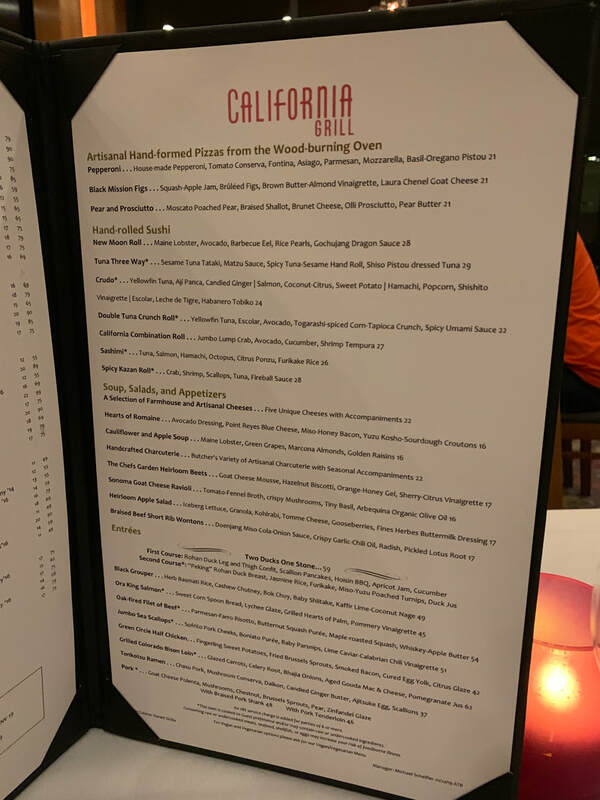 This is an off menu dessert, but since desserts at the Rose & Crown generally run around $7, and assuming you go with the most expensive items, you would end up paying $48 if you purchased the items separately. After tax and gratuity (assuming a 20% gratuity), the bill would total of $60.72. Add in a pint of the UK's fines (with tax and tip) and you'd end up at around $75.00. So if you get more than one drink, you're making money. If you are interested in this event, I would highly recommend taking an Uber from our Encore Resort at Reunion vacation home. 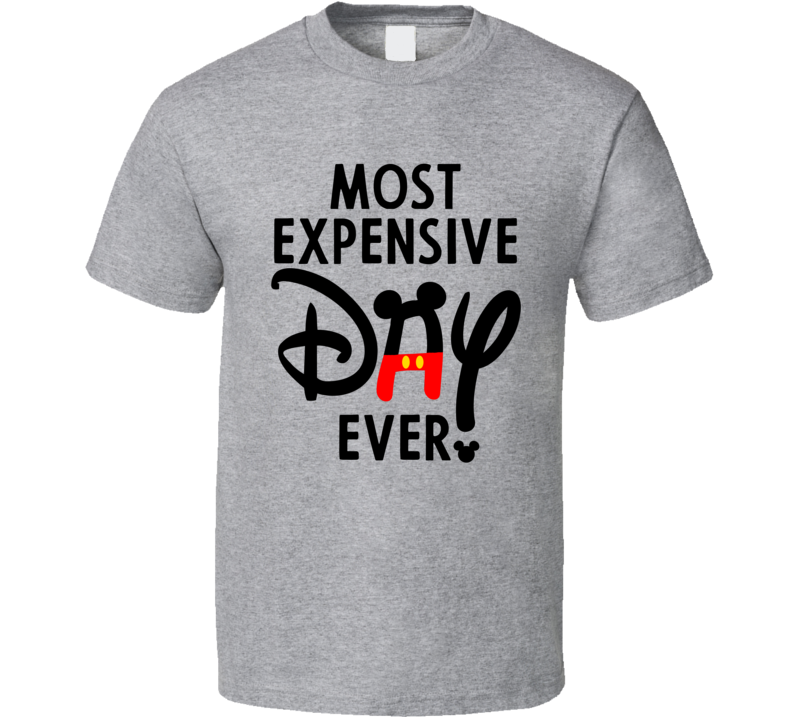 The cost is generally under $20.00 each way, which is not only socially responsible, but also saves you the price of the Walt Disney World parking cost. 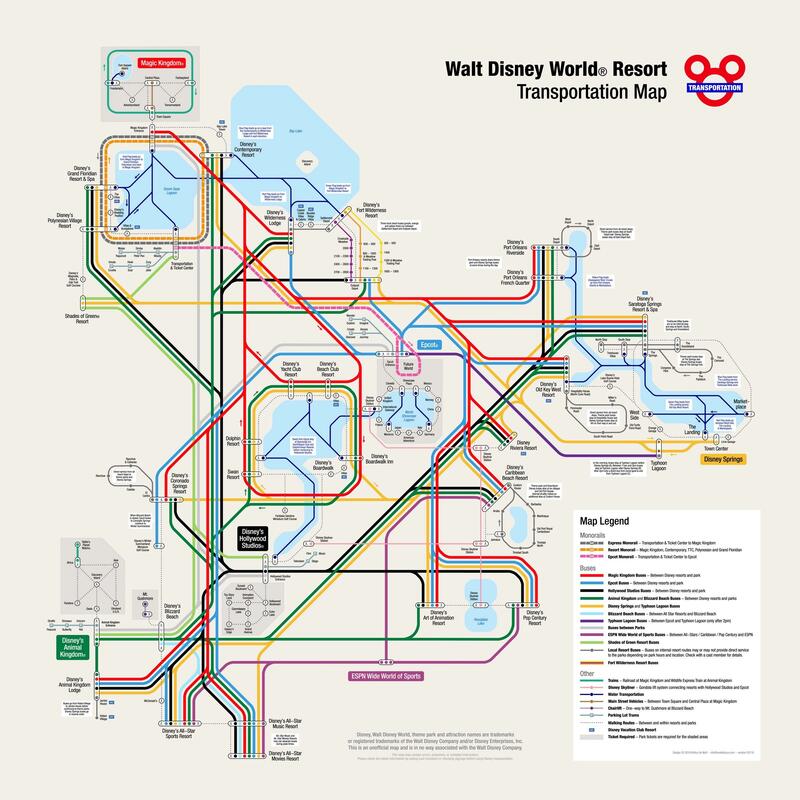 You may recall in February I posted this awesome transportation map of Walt Disney World, with an omage to traditional municipal subway or bus route maps. The map is the creation of artist Arthur De Wolf (www.wdwfocus.com/map) and has been updated to include the new Skyliner - a gondola system linking Epcot and Hollywood Studios with a few of the Walt Disney World Resort hotels. If you are relying on Walt Disney World transportation to get you from park to park or even within a park, this handy map will be your best friend. The map does show, however, how complicated Disney's transportation system can be. I often hear the argument made by travellers to Orlando that the bus transportation between the Disney hotels and the theme parks is a perk to staying on Disney property. My response to this is - "Your community has an amazing bus system too - do you ever take it to the mall?" The answer by most is no - because they enjoy convenience and non crowded nature of driving. The answer is the same for a Walt Disney World vacation. We prefer to drive our rental car from our Orlando Encore Resort at Reunion vacation home to the parks. We can come and go as we please and we don't have to wait in line to board a crowded bus full of strollers. Yes, you do have to rent a car, but Orlando car rentals are among the cheapest in the country and it gives you the options of visiting Universal Orlando, Sea World or spending a day at the Outlet Malls. Yes - you have to pay parking fees at the park, but guess what - Walt Disney World charges hotel guests daily parking at their hotels too. 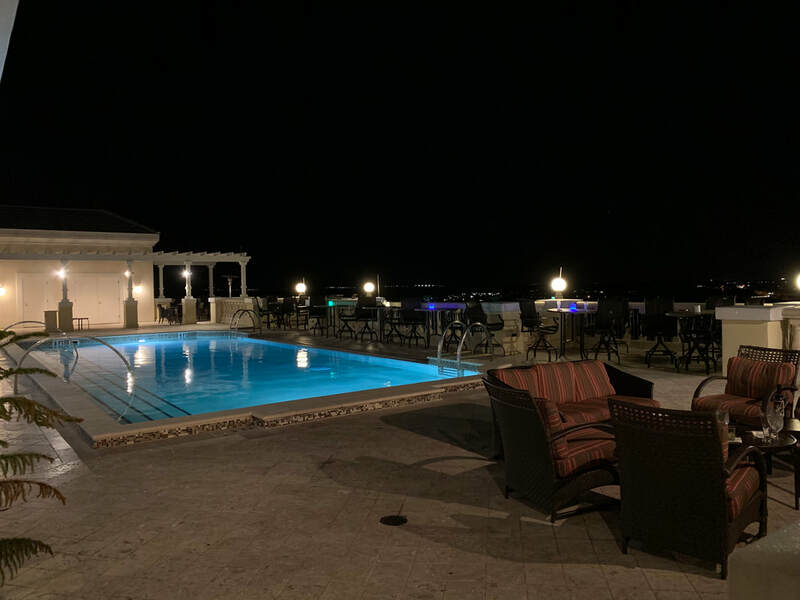 And the rental rate savings, extra living space and private pool you get from renting our vacation villa rental far outweigh any advantages to staying "on property". 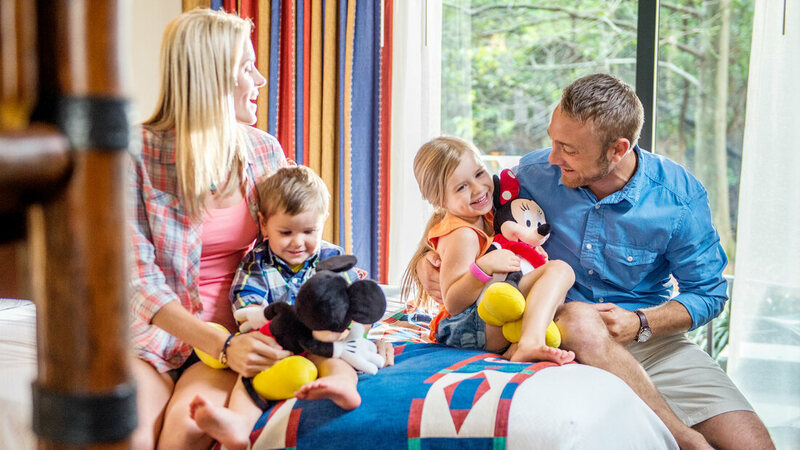 If you traditionally have stayed at a Walt Disney World resort and you want to try staying off site, contact us for more information and details. So you have your Orlando vacation home at Encore Resort at Reunion booked for the holidays and now you are looking for a little fun before embarking on your Walt Disney World vacation during Christmas? 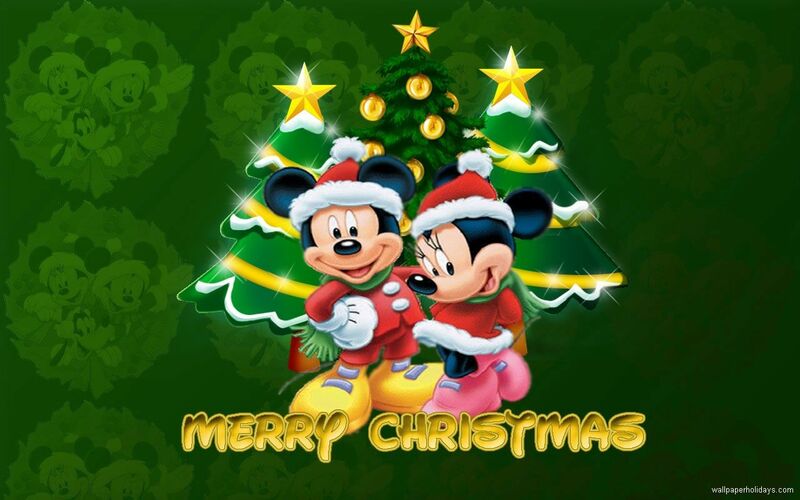 Try calling 407-939-6779 and get a few fun holiday messages from Mickey Mouse and the gang. The hotline is set up primarily as a way to purchase tickets for Mickey's Very Merry Christmas Party (press 1 for tickets); however, if you are up for a holiday joke or a little message from Mickey Mouse, press 2 and pick your options. Enjoy! Attention DIY crafters!! Are you looking for the perfect gift for a Walt Disney World fan? Here's a great craft that can be enjoyed by people of all ages (especially kids). 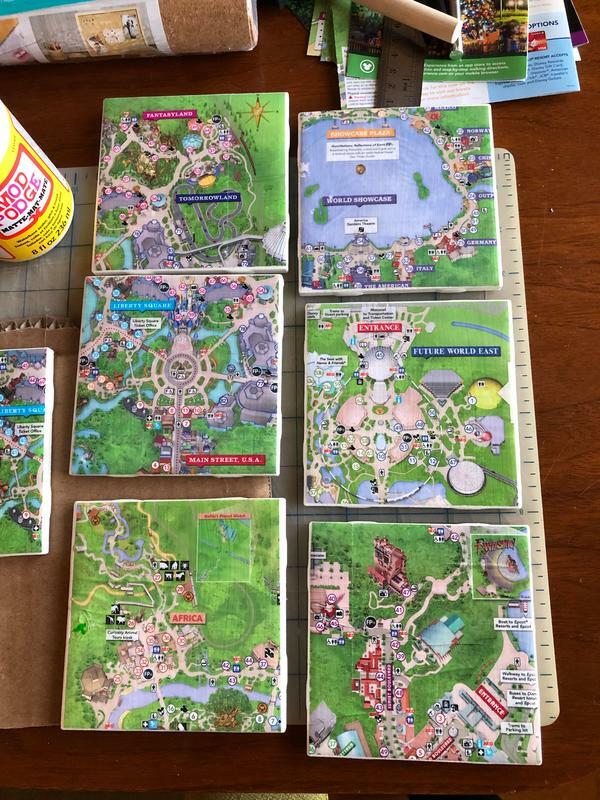 To make these Walt Disney World coasters, all you need are some ceramic tiles, cut out paper of your favorite Disney images (printouts of characters, Disney Park maps, ride concept art, etc), Mod Podge glue and felt. If you want to see how easy it is to create these fun coasters, check out this video. Surprise that special Disney fan in your family and have these coasters available for Christmas morning eggnog. If making this craft gets you thinking that a trip to Walt Disney World is in your future, please contact us to find out if our Encore Resort at Reunion vacation home, located just minutes from Walt Disney World and Universal Resort Orlando, is right for you. We are only 3 weeks until Christmas. For those of you who are heading to Walt Disney World, the time can't tick by fast enough. To help you count down the days to the magic, check out our earlier Encore Resort at Reunion Vacation Home Blog post where you will find a DIY Disney Vacation Countdown Calendar. 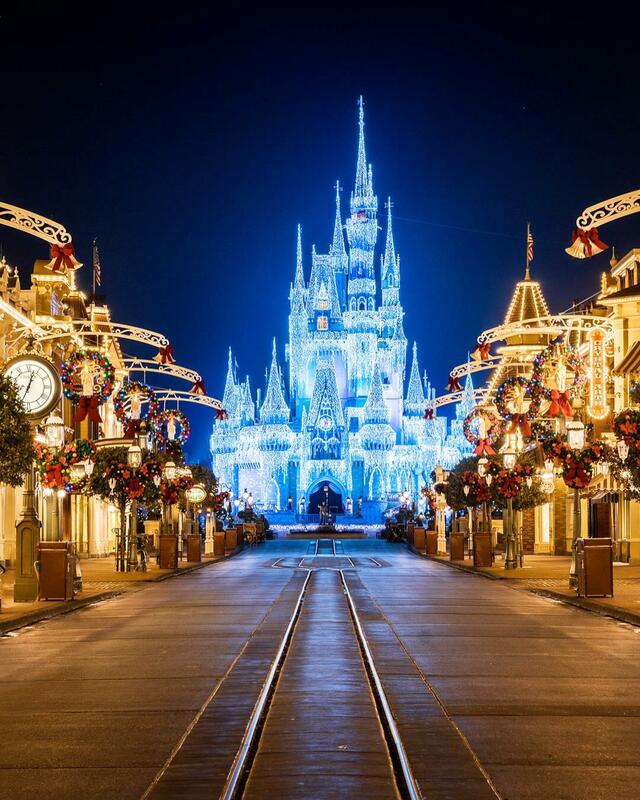 You can also create a Disney World Days Until Christmas Calendar as well. Enjoy!